Lighting for reef aquaria is still an area of considerable debate. Contributing to the debate is a lack of knowledge of the spectral analysis of light and of specific details about the lamps that hobbyists use over reef aquaria. In recent years, Dana Riddle and Richard Harker (1997a, b) have conducted some research on artificial reef lighting. They based most of their research on using “photosythetically available radiation” (PAR) as a measure of lighting used over reef tanks. However, PAR by itself is not enough, because it does not provide any information about the spectral quality of light. Both spectral quality and intensity are important aspects of reef aquarium lighting. to determine changes in spectral quality over time (this will be covered in Part 2). The overall goal is to educate the aquarist about the choices available and to provide some quantitative data with which he or she can evaluate the correctness of the rules of thumb that hobbyists currently use. This article does not suggest which lighting choices are best for reef aquaria, but rather it provides objective data about the lamps that hobbyists currently use. We hope these data can be constructively used to analyze light related observations and to provide a basis for assigning them to specific lamp output. It is difficult to obtain useful information from lighting manufacturers. Even when the manufacturers provide data, the data is usually insufficient to draw interesting conclusions about the products. For example, manufacturers sometimes provide plots of relative intensity or log plots, but they do not specify conditions under which the data was gathered. Without knowing those conditions, we cannot make comparisons between different lamps. In this series of articles, we intend to provide some raw data, taken under known conditions to enable a systematic comparison of the lamps we included in our study. In order to achieve a better understanding of the data and its interpretation, it is important to first understand the basics of light and light measurements. There is a lot of confusion among aquarists about light terminology, the various units of measurement used and their relationships to one other. There are several theories that describe radiant energy. The quantum theory and the electromagnetic theory are the two theories that provide the most relevant explanation of those characteristics of radiant energy that are useful for understanding photosynthetic requirements and illumination. According to the quantum theory, radiant energy is transmitted and absorbed in discrete particles called quanta or photons. The electromagnetic theory states that the radiant energy is propagated in the form of an electromagnetic wave. As with any wave, radiant energy has a wavelength and a frequency associated with it. The wavelengths of visible light are usually expressed in nanometers, where 1 nm = 1 billionth of a meter. Most light sources, including metal halide lamps, emit energy at many wavelengths. A spectrum is a graphical representation of this energy, in which each wavelength is shown separately. Different wavelengths of visible light appear to us as different colors. Light in the low end of the visible spectrum, at about 380 nm, is violet. Increasing wavelengths correspond to the progression of colors you see in a rainbow: violet, blue, green, yellow, orange and red. The upper wavelength limit of visible light is at about 770 nm. The frequency, velocity, and wavelength of the radiant energy, and the medium through which the radiant energy is traveling, are related as follows: For a given medium, such as air or water, all radiant energy is transmitted at the same velocity. Hence, radiant energy with a higher wavelength must have a lower frequency and vice versa. For example, blue light at 400 nm has a higher frequency (57 percent higher) than red light at 700 nm. Hence a photon of wavelength 700 nm has 57 percent as much energy as a photon from the blue end at 400 nm. As the frequency of the radiation increases (wavelength gets shorter), the amount of energy in each photon increases. Photometry is the measurement of radiant energy in the visible range (380 nm to 770 nm) evaluated in terms of a human visual response (rather than the response of photosynthetic organisms). Radiometric measurements are used when we are interested in the radiant energy for the purpose of spectral analysis and photosynthesis, whereas photometric measurements are used when we are interested in the visual stimulation aspects of radiant energy. Table I shows various photometric and radiometric quantities and their units of measure. The radiant energy is measured in Joules and the rate of flow of the radiant energy is called the radiant flux (units: watts). Irradiance is the radiant flux incident on a receiving surface from all directions per unit area of surface (units: watts/m2). All the properties of radiant flux depend on the wavelength of the radiation. Spectral irradiance is the irradiance at a particular wavelength, per unit wavelength interval. A waveband is a continuous range of wavelengths between two limits. For example, photosynthetic available radiation (PAR) is defined to be the radiation in the 400 nm to 700 nm waveband. The irradiance within a given waveband is the integral of the spectral irradiance between the limits of the waveband. The units for PAR can be specified in energy terms or in photon terms. In energy terms, PAR is expressed as PAR Irradiance, which is the total energy in the PAR range (400 nm to 700 nm). The units of PAR Irradiance are watt/m2. When measured in photon terms, PAR is also called Photosynthetic Photon Flux Density (PPFD), which is a measure of the number of photons in the 400 nm to 700 nm waveband that are incident per unit time on a unit surface. When expressed in photon terms, all the photons are considered equal, independent of their energy. The quantity of photons is measured in moles of photons (1 mole of photons = 6.022 x 1023 photons = 1 Einstein). In practice, PPFD is measured in microEinstein/m2/second, or µE/s*m2. The conversion between the radiometric units and photon units is complicated and requires that the exact spectral distribution of the source be known. In addition, there is not a one-to-one relationship between PAR and spectral distribution. Different light sources with identical PAR can have very different spectral distributions. The independence of PAR and spectral distribution is the reason we must consider spectral distribution data as well as PAR data when we compare lamps. Most of the lighting industry’s customers use lamps for satisfying human visual needs for illumination. Thus, most of the easily available lamp data is in photometric units. Photometry refers to the measurement of visible radiation (light) with a sensor having a spectral response curve equal to that of the average human eye. The human eye responds differently to light of different colors and has a maximum sensitivity to green and yellow. The spectral response curve of a typical human eye is called the CIE Standard Observer Curve. The response of the human eye is very different from that of photosynthetic cells. Hence, from the point of view of a reef aquarium, where light primarily serves the photsynthetic needs of the corals, the photometric measures are not of much practical use. For completeness and because most available lighting data is supplied for illumination purposes, the photometric terms are also defined here. Luminous flux is the amount of radiation coming from a source per unit time, evaluated in terms of a standardized visual response (units: lumen). Illuminance is the density of luminous flux incident at a point on the surface (unit: lux = 1 lumen/m2). Converting between photometric units and photon units requires that we know the spectral distribution of the radiation source, just as we saw earlier for converting between radiometric units and photon units. Two other measures of light are also interesting to reef aquarists: the Correlated Color Temperature (CCT) and the Color Rendition Index (CRI) of the light source. Color temperature refers to the spectral distribution of light radiated from a black body as it is heated. A black body is an ideal object that absorbs all light incident upon it. This complete lack of reflectance implies that the apparent color of a black body in no way depends on the light that falls on it; a black body gets its apparent color only from the light that it radiates. This visible light radiated by a black body changes from red to blue to white as the temperature of the object increases. The color temperature of the light emitted is expressed as a temperature on the Kelvin scale, and corresponds to the temperature of the black body at which the light is emitted. This is known as the black body model. Most lamps do not follow the black body model completely. That is, the spectra of most lamps does not correspond to the spectrum of any true color temperature. For this reason, and also because it is very hard to measure the temperature of a filament or an arc tube, a value called correlated color temperature (CCT) is commonly used rather than color temperature. CCT is a calculated value, which provides the closest approximation to the color temperature of a true black body. The temperature that is the closest match is referred to as the CCT. Color rendering index (CRI) indicates how much a lamp will cause an object to shift in perceived color compared to its color under natural light of the same CCT. CRI numbers range from 100 (no color shift) to 0 (black and white). For the purpose of analyzing the light sources available for lighting aquaria, the spectral distribution is the most important piece of information, because all radiometric and photometric quantities can be derived from it. The instrument used for measurement of spectral distribution is called a spectroradiometer. The spectroradiometer we used is the LiCOR LI-1800/12 portable spectroradiometer (Licor) with a standard cosine receptor. It is capable of measurement from 300 nm to 850 nm at 2 nm intervals. The specific instrument we used was calibrated for use from 310 nm to 850 nm. The lamps were mounted in a fixture that positions the center of the lamp’s arc tube 18 inches from the cosine receptor. We wanted to measure only the direct light coming from the lamp, without any contribution from reflections of the lamp’s output, nor from stray room light. Hence, the fixture does not have a reflector and was in a dark room with walls painted dull black. We used the same setup to test all the lamps. We used a single Magnetek ballast (part #1110-247SC-TC) with all the lamps. The lamps were allowed to warm up for about 20 minutes before recording the readings. A few readings were taken during this warm up period, to make sure the light output from the lamps had stabilized before we began recording readings. The spectroradiometer was programmed to take the average of three consecutive readings and to record the data automatically. The IBM PC Interface program (LICOR proprietary software) was used to analyze the data collected. Red — 650 to 700nm. In addition, because the spectroradiometer can collect data in the UV-A range (310 nm to 400 nm), we also calculated the amount of UV-A radiation. * This lamp is currently being sold in the hobby as a 10,000 K lamp from Hungary. Brand new lamps of the types listed in Table II were tested, after the standard initial 100 hour burn-in period. Because in most cases only one lamp of each type was available for testing, we were not able to account for variations between different lamps of the same type. We had three of the Iwasaki lamps. We discarded the data from the best and the worst of them and are reporting data for only the middle one. The plots in Figure 1 show the spectral distribution of the lamps, quantitatively and on a common scale. You can see that the lamps have a wide range of spectral distributions. These spectral distributions arise from the different combinations of halides that different lamps use. Halides are chemical compounds that emit light when they are hot. Different halides emit different wavelengths of light.
. The Iwasaki 6500 K has a higher output than the other lamps over the entire PAR range (400 nm to 700 nm), except for two spikes from the other lamps. The Aqualine Buschke 10,000 K lamp shows a slightly higher output than the Iwasaki in the violet range (400 nm to 440 nm) and the Osram/Radium 20,000K and the Coralife 10,000K both have a large spike at 454 nm. 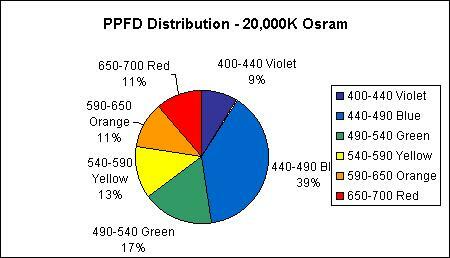 Using this spectral distribution, we computed the PPFD (or PAR in the range 400 nm to 700 nm) for each lamp. Figure 2 shows a comparison of the various values. The output of light in the photosynthetic range of the Iwasaki lamp is about 50 percent higher than the output of the 10,000 K Aqualine Buschke lamp, 75 percent higher than that of the 20,000 K Osram/Radium lamp and almost 100 percent higher than that of the 10,000 K Coralife lamp. Realizing that PAR by itself is not a complete measure of the lamp’s usefulness for reef aquaria, a more aggregate view of the spectral distribution and the contribution of the different wavebands to the total PFFD is shown in Figure 3. 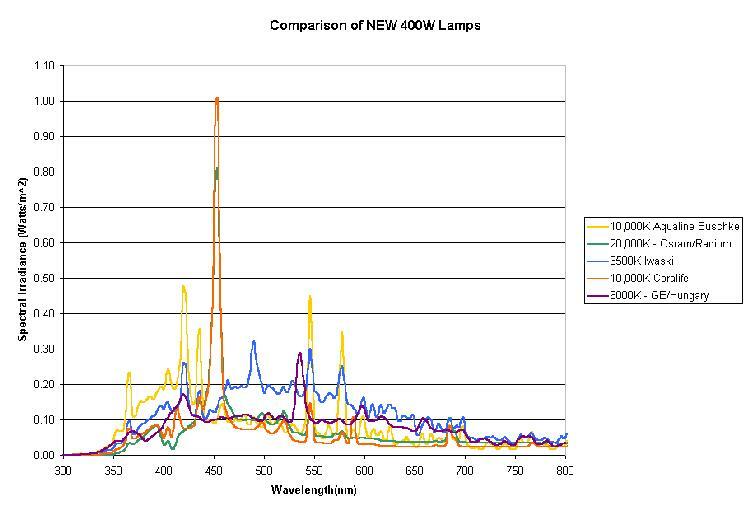 Figure 3 gives an interesting view of how each lamp performed in six different color bands, each comprising about 50 nm. 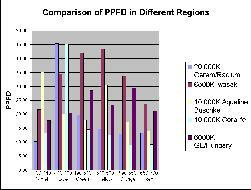 This view shows how the total PPFD is distributed for each lamp. If we believe that the blue and violet light components of the lamps are more important than the longer wavelengths, then the total significant output in these bands for the 10,000 K, 20,000 K and 6500 K lamps is similar. 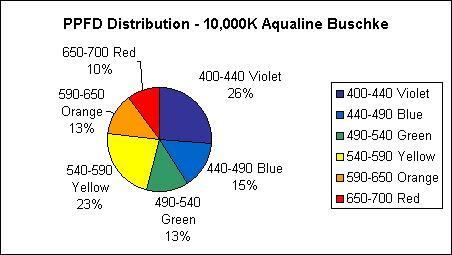 The output of the 10,000 K Aqualine Buschke lamp is skewed toward the violet end of the spectrum. The output of the 20,000 K Osram/Radium and 10,000 K Coralife are skewed toward the blue end of the spectrum. The Iwaski 6500 K lamp has a more uniform distribution over the entire spectrum, with higher output in the yellow and green range, which gives it the yellowish/green cast that most aquarists complain about. 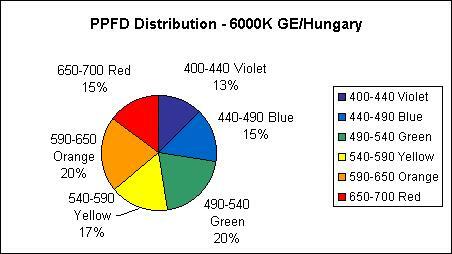 The Hungarian/GE 10,000 K lamp has a distribution that is very different from the 10,000 K Aqualine Buschke lamp. The Coralife 10,000 K lamp has a spectral distribution that is almost identical to that of the 20,000 K Osram/Radium lamp. This spectrum explains why most hobbyists find that the 10,000 K Coralife lamps are too blue when compared with other 10,000 K lamps. Another way to analyze a lamp’s output is to consider the percent of the lamp’s total output that different color ranges contribute to the total. The following charts make it easy to see where each type of lamp emits the greatest and the least amounts of energy. You can easily see the strong blue component of the 10,000 K Coralife and the Osram/Radium 20,000 K lamps. The 10,000 K Aqualine Buschke lamp has a fairly even distribution, aside from 28 percent of its output being in the violet range. 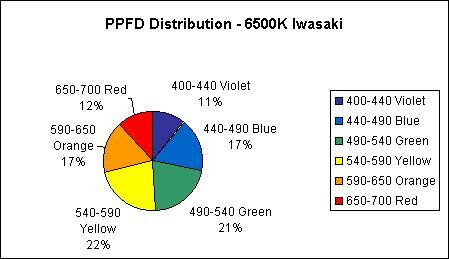 The 6500 K Iwasaki lamp shows a more even distribution. 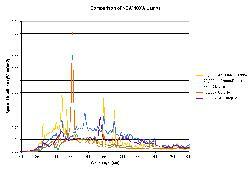 Figures 4 through 8 show analyses of the spectral distribution of each of the bulbs based on color ranges. 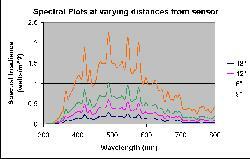 In addition to PAR measurement, the spectral data can be used to calculate Correlated Color Temperature (see Table III). The CCT really just gives you an idea of what type of light this lamp is putting out. Because metal halide lamps do not follow the black body model closely, you can have lamps with very different spectral curves and PAR output but with the same CCT. Because human eyes are not equally sensitive to light at all wavelengths, two lamps of similar CCT can look much different to the eye. The CCT for the 20,000 K Osram/Radium lamp was out of the range of the software used to compute CCT. By definition, CCT can be determined only for sources that have at least some similarity to a black body. In order to calculate the CCT or to determine it graphically, the lamp’s output must be a mixture of different colors of light. If a lamp is too monochromatic (made up of one color) its CCT cannot be determined. The 20,000 K Osram/Radium and the 10,000 K Coralife lamps we tested were such lamps. Both lamps had so much more light in the blue range than in any other range that they appear monochromatic. 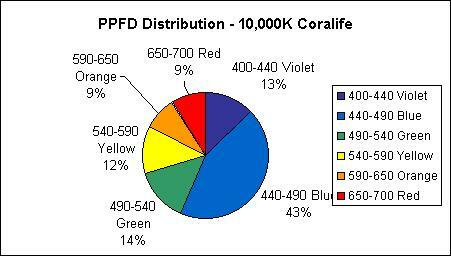 A true 20,000 K lamp, while still favoring the blue, would have more output in the red, yellow and green ranges. A true 10,000 K lamp would look similar, but would be somewhat less heavily weighted toward the blue. Another concern of aquarists is the amount of ultraviolet (UV) radiation the lamp generates. The single ended lamps used in the hobby are surrounded by a borosilicate glass bulb that absorbs a significant amount of the UV — hence most of these lamps can be used without additional UV protection. Figure 9 shows the comparison of the UV output of the lamps, measured in photon units, integrated over the 310 nm to 400 nm waveband. The 10,000 K Aqualine Buschke lamp had the highest UV output, measured in photon units. All the data collected was at a distance of 18 inches between the arc’s center and the sensor. This consistency allows comparisons between the lamps. In practice, most aquarists position their lamps closer to the water surface. In theory, we can predict the PPDF at other distances, because point sources of light follow the inverse-square law: Intenstity is inversely proportional to the square of the distance between the source and the surface at which it is being measured. So, if we halve the distance between the lamp and the surface of the water, the intensity should quadruple. To test how closely the metal halide lamps followed the theory, data was collected on a 6500 K lamp at distances of 18, 12, 9, and 6 inches from the sensor. 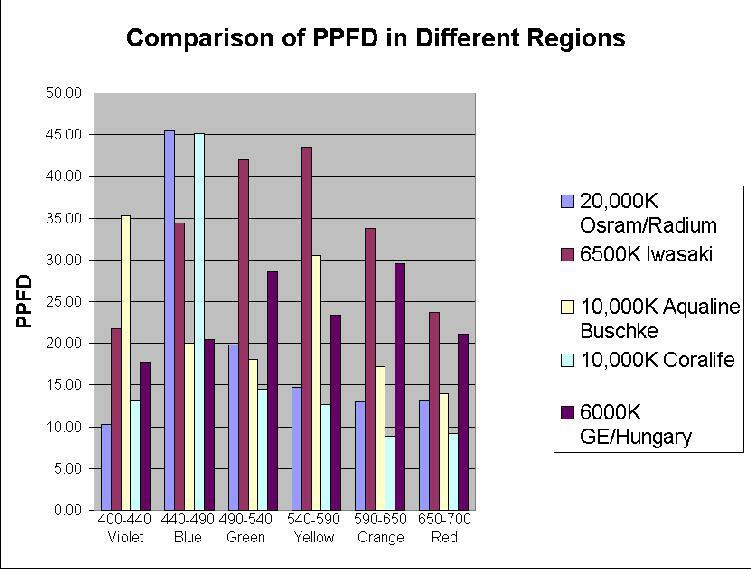 Table IV shows the PPFD from these measurements. The lamp almost follows the inverse square law. At a distance of 6 inches from the water, the lamp has an output of 1628 µE/s*m2. The output of the noon sun on the reefs has often been quoted as 2000 µE/s*m2. Also, as expected, there was no significant change in the CCT of the lamp as a function of distance. 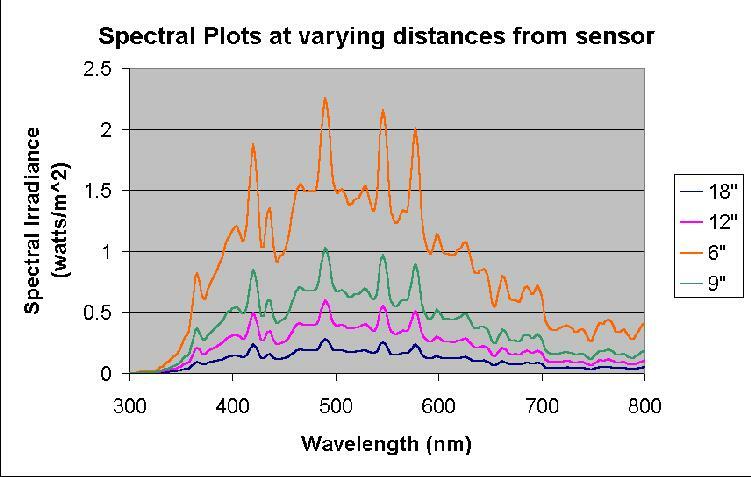 Figure 10 shows the spectral plot at the various distances. Spectral analysis of lamps is a valuable tool for understanding the quality of light that is output by the lamps currently used in the hobby. This work has built on and added considerably to the existing work of Dana Riddle and Richard Harker. It is not the intent of this article to discuss the implications of the data to reefkeeping and to develop a single right answer to the lamp choice question. We hope these data will help to explain the light related observations in aquaria, to select suitable lighting for reef aquaria, and to spark lively debates about light, photosynthesis and photoadaptation. In the next installment of this article we will present our results on the changes in spectral intensity that lamps experience over time. Some of the other testing currently underway includes 250-watt lamps. We will follow that work with tests on 175-watt lamps. We would like to continue collecting data on metal halide lamps, to provide more rigor to the tests. We would like to appeal to the aquarists to help by loaning us the lamps for testing. If you have lamps that you would be willing to provide for the study, please contact Sanjay Joshi or Dave Morgan. Acknowledgements —We would like to thank several hobbyists, without whose help this study would not have been possible. These aquarists were kind enough to loan us their new and used 400-watt lamps to help reduce the financial burden of having to acquire all the lamps: Richard Harker, Dana Riddle, Wayne Shang, Mike Fontana, Jack Chernega, Eric Borneman, James Wiseman and Dan Wohls. Finally, we would like to thank Dr. Paul Walker of Penn State University and LiCor Inc., for the use of their spectroradiometers and dark rooms for testing the lamps. Publications Inc. All rights reserved.